The following issue occurred on a Windows 10 Home PC: Cortana search returns no results. In fact the problem is, that, after you type your question in Cortana's search box, the results field goes white and you don't receive any search results. In this troubleshooting guide you 'll find detailed steps to resolve the following search issues when using Cortana on Windows 10 OS: Cortana search does not work and does not return any results. How to fix: Cortana Search Not Working and Returns No Results. Method 1. Restart Cortana Search process. Method 2. Troubleshoot search and indexing. Method 3. Rebuild Search Index. Method 4. FIX Windows corruption errors with DISM & SFC tools. Method 5. Perform a Windows 10 Repair with an in-place upgrade. 1. Press Ctrl + Shift + Esc to open the 'Task Manager'. 2. Select the 'Processes' tab, if it is not already selected. * Note: If you don't see the 'Processes' menu, click 'More Details'. 3. Right click in Cortana process and click End Task. 4. Now perform a search with Cortana. If the problem perists, continue to the next method. 2. Type: control and click OK.
3. Change the View By (at the up right) to Small icons and then click Indexing Options. 4. Select Troubleshoot search and indexing. 5. Select your problem from the list and click Next. 6. Choose Try troubleshooting with administrator permissions (if prompted). 7. If the troubleshooter can fix the search issues, then try to perform a search with Cortana. If the troubleshooter couldn't identify the problem, then continue to the next method. 3. At 'Indexing Options' click Advanced. 5. Click OK at the information message. 6. When the Indexing is completed, try to use Cortana again. 2. Type CMD and then press CTRL + SHIFT + ENTER to open an elevated command prompt. The in-place upgrade and repair method, is the most secure solution to fix many issues in Windows 10. To perform a repair upgrade of your Windows 10 installation follow the detailed instructions on this article: How to repair Windows 10. « How to Convert Install.WIM to Install.ESD or Vice Versa. » What is the Windows.old folder and how to delete it. In number 4, how are we supposed to search for the command prompt if the search isn't working? 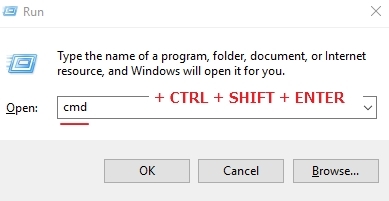 Maybe better to suggest 'hit win+r, type cmd, then hit ctrl+shift+enter to run elevated. @Matty McAllister: thank you for the remark. You have absolutely right. The article was corrected.